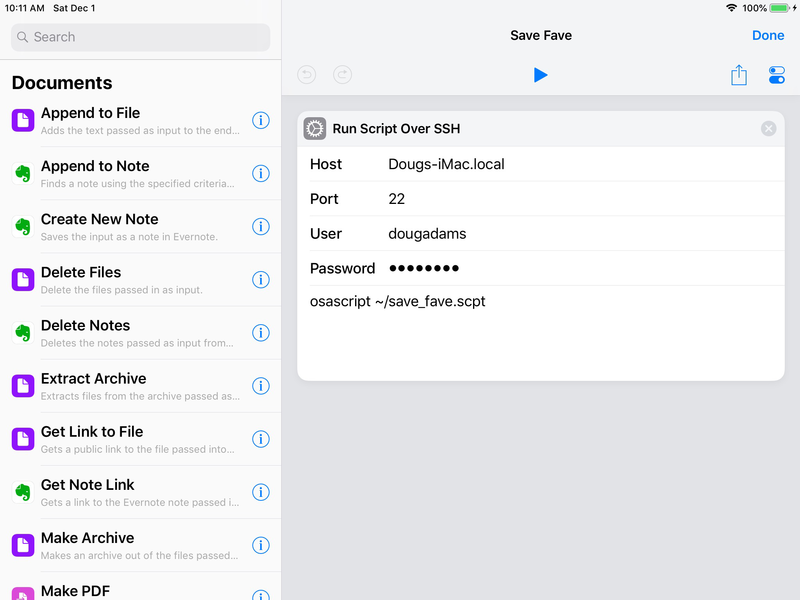 Tap “Create Shortcut” from the Shortcuts Library and drag the Run Script Over SSH action to it. It’s best to locate it with the Search field. Enter the Host name for the computer you want to target. You can find this name in the Sharing panel of that computer’s System Preferences. Don’t change the Port number (unless you know better). Enter the User name and Password for the account to target. In the bottom section, that will say “Script”, enter “osascript”, a space and the path to the script that will be fired (we’ll get to those details in a moment). I’ve made this Shortcut able to be activated by Siri. You can see there are also options for launching it in other ways. Do as you will here. 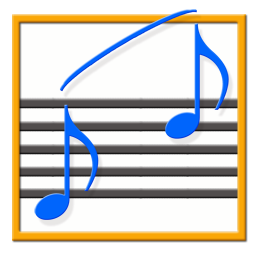 property favePlaylist : "My Favorites"
Click the AppleScript icon above to (eventually) open this in Script Editor or copy and paste the text above to a new Script Editor document. Save the script named “save_fave” with Format set to “Script” in your home folder. Technically, you can name and save the script pretty much wherever you want, as long as you correctly enter its path in the Shortcut. Also, don’t use any spaces in the file path unless you escape them. By the way, I have seen examples of this where actual AppleScript is typed into the “Script” panel. While this is, uhm, handy, I would discourage writing osascripts with the “-e” flag. Escaping quotes and other nonsense is just too messy. So, everything is now set up. 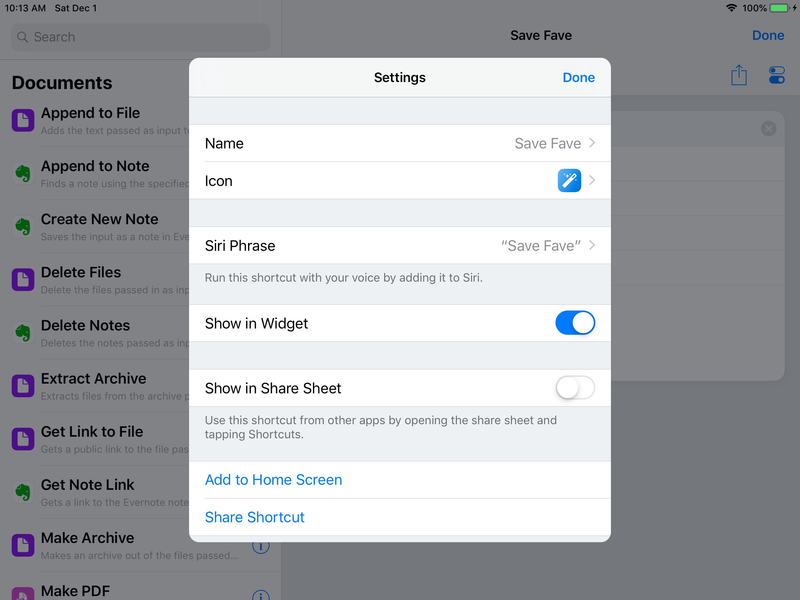 While a track that you like is playing on iTunes, tell Siri on your iOS device to “Save Fave” and the script will run. The first time the script runs, you may want to be nearby the Mac as it may ask your permission to launch the script. This will not happen later, unless you modify the script. How I’d use this: I’m playing iTunes and sending audio over AirPlay to sets of Airport Expresses hooked up to speakers. In one case, I like the music only in the Kitchen and Dining room. But in another, I like the music over my Mac’s audio system in my office and an Airport Express in the Living Room (“Southern Express”). When I run this script, if it detects that the “Kitchen Express” is one of the current AirPlay devices, it will switch to the other set; and visa versa. Suppose I just tell Siri to “Swap Airplay”. Obviously, to use this yourself, you will have to hard-code the names of your AirPlay devices. One note: my paranoid security buddies have not yet weighed-in on any evil-doing this sort of arrangement could induce; one can imagine some kind of code injection or something is possible. On the other hand, SSH is pretty secure. But, if you think doing something like this may expose you to evil-doers, then refrain.